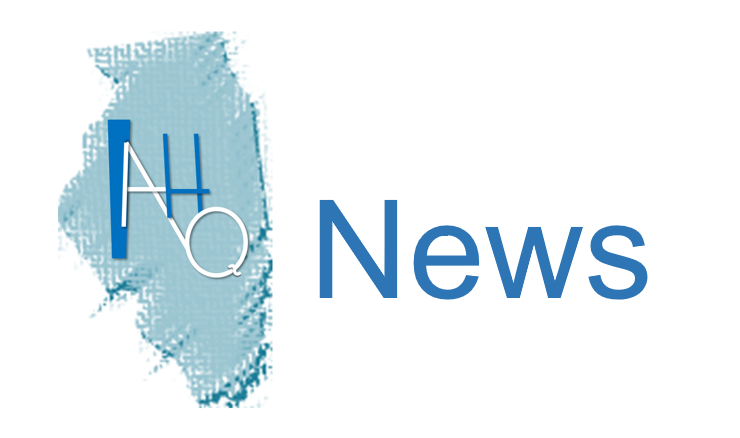 IAHQ News is a periodic communication to members and non-members of the Illinois Association for Healthcare Quality (IAHQ) about upcoming events and resources available to healthcare quality improvement professionals in Illinois and the surrounding areas. To submit items that will be of interest, please send an email to IAHQ.net@gmail.com. Your work may be highlighted on an upcoming webinar at the 2018 IAHQ Annual Conference! You may also visit the NAHQ website to download complimentary resources such as a press release template, poster, and sample posts. You can also order HQW items for giveaways and prizes. If you cannot attend in NAHQ Next in Cincinnati from September 18-20, register as a virtual attendee at NAHQ Next. It offers more content than ever before with a curated program to help you translate quality into practice from the comfort of your own home or office. Earn up to 10 CPHQ CE and nursing contact hours through session participation and streamed viewing. Register now . The University of Michigan, Blue Cross Blue Shield of Michigan Value Partnerships, and the Michigan Surgical Quality Collaborative (MSQC) have begun an effort to bring together other statewide initiatives by establishing the Center for Excellence for Collaborative Quality Improvement (CECQI). This meeting is planned in order to grow and support a community of state-wide surgical quality improvement collaboratives. For more information, visit: https://www.cecqi.com/ The summit is followed immediately by the Michigan Surgical Quality Conference, October 5-6. Both meetings are being held at Boyne Mountain. True quality improvement and patient safety requires moving from a culture of blame to understanding the impact and interplay of key components of our organizations systems – why did this happen? vs. who messed up? ‘Just Culture’ is an approach that helps us understand different levels of human accountability when errors do occur and what the appropriate response should be when somethings go wrong. Just Culture encourages the creation of an environment of free and open error reporting to understand root causes and help prevent recurrence. This helps to build a culture, which encourages coaching and honesty at all levels, in order to bring about the best possible outcomes. In this 60-minute webinar, you will hear from David A. Marx, JD, CEO of Outcome Engenuity, recognized as the father of Just Culture, and Stephen G. Jones, Medical Director for Safety, Yale New Haven Health System, where a Just Culture approach has implemented. Please Register here. As the U.S. healthcare system shifts to more value-based care, health care providers and professionals need to be prepared to make major changes in the way they structure, organize and provide care. Orthopedics, specifically joint replacement was one of the first conditions targeted by the new “bundling” approach implemented by the Centers for Medicare and Medicaid Services (CMS) in 2016. In this 60-minute webinar, you will hear from Anthony M. DiGioia, MD, from the Bone and Joint Center at Magee-Women’s Hospital of UPMC, about how he and colleagues prepared for this major change and what their experience has been so far. As CMS moves to expand value-based care and bundling programs to other specialties, these lessons will be invaluable. Dr. DiGioia will also discuss his soon-to-be released book, The Patient-Centered Value System: Transforming Healthcare Through Co-Design. Lessons in QI from the California Maternal Quality Care Collaborative : November 28 at 12 pm CT, featuring David Lagrew, MD, Executive Director Women’s Services, St. Joseph HOAG Health. PCPI will be holding it’s 2017 Fall Conference from October 24-26 in Rosemont, and IAHQ qualify for the member discount and attend advisory committee meetings. The conference brings together leaders from performance measurement, clinical registries, and quality improvement to share ideas, network, and collaborate on innovative solutions to improving health outcomes. Keynote speakers include: Glenn Steele Jr., MD, PhD, Chairman, xG Solutions and former CEO of Geisinger Health System; John Mattison, Assistant Medical Director and Chief Medical Information Officer at Kaiser Permanente; and John Toussaint, MD, CEO at Catalysis and formerly CEO of ThedaCare, and Shingo Prize-winning author of Potent Medicine the Collaborative Cure for Healthcare. There will also be a special breakout session on how North Shore Physician Group (Massachusetts) improved flow, physician satisfaction and patient safety by using the Virginia Mason Production System. For more information about the 2017 Fall Conference, use the link provided. The IAHQ board is exploring the replacement of the existing website with a more current and interactive site. Stay tuned for more information and a potential launch date later this year. Meanwhile look for announcements about upcoming events and resources in your email and in the LinkedIn Member Group.